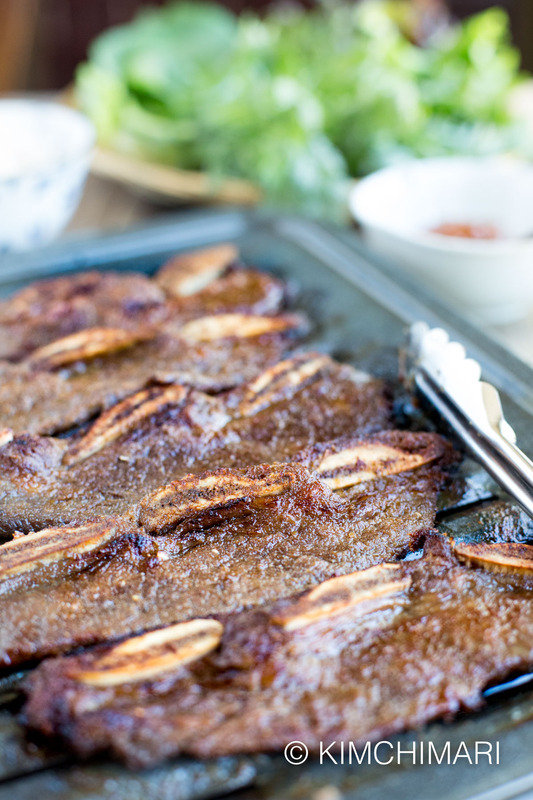 You are here: Home / Uncategorized / Kalbi – Easy Korean Short Ribs Blender Marinade for BBQ! 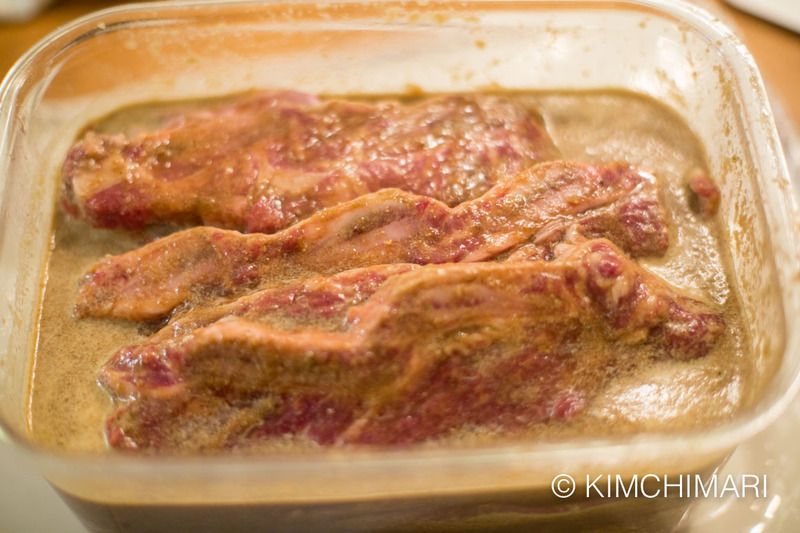 Kalbi – Easy Korean Short Ribs Blender Marinade for BBQ! 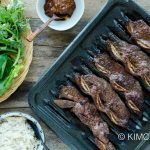 Kalbi or Galbi (Korean Short Ribs) – however you want to spell it, it is simply the best way to eat short ribs on the BBQ. I don’t know why I never wrote a separate post just on Kalbi. I wrote a Summer BBQ Party post some time ago and shared a Kalbi recipe there but I just don’t have a good explanation why I never posted a stand alone one. 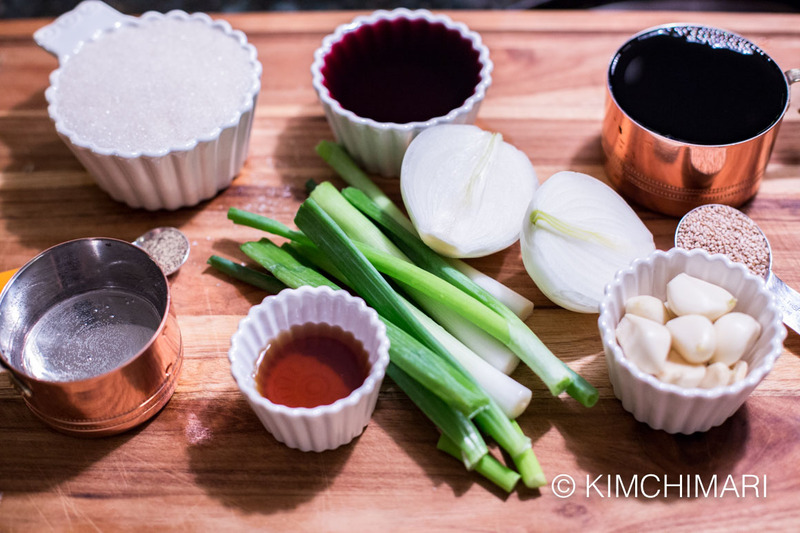 In addition to the fact that this post has my latest recipe for Kalbi that uses red wine instead of rice wine and onions instead of kiwi, I will also show you how to grill Kalbi in the oven using the broiler, in case you don’t want to grill on a real BBQ. Kalbi memories?? Haha.. Yes….Grilling Kalbi outside in our backyard or at our farm in Icheon… was probably one of the happiest moments of my childhood. You know me, happiness is ALWAYS linked with food.. HAHAHA.. I think they were my happiest moments not just because we got to eat the most delicious short ribs BBQ, it was also because I felt the happiness and joy of my whole family as my brother and sisters shared in excitement, their brilliant ideas on how to make our family BBQ party even better. Right, so let’s not waste another meal and let’s get started. 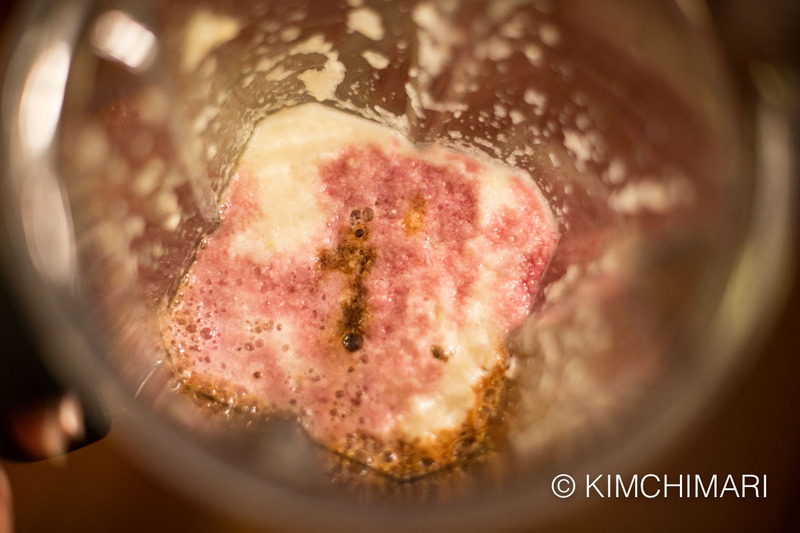 NOTE – This marinade is made using a blender which means there’s no chopping required!! It is not the traditional way but the taste is totally authentic and yummy!! If you don’t have a blender, you can just chop all the vegetables finely and mix. Fill a bowl with water and add short rib pieces to the bowl. Pick up each rib piece and rinse under running water to wash off any bone bits that may exist. Trim any chunks of fat but most of the fat will melt away during grilling time. These ribs were good quality ones with minimal fat. Drain washed ribs. While ribs are draining, cut onion into chunks or just half, if onion is small. Cut green onions into shorter lengths to fit into the blender. Here’s all the ingredients for the marinade to go into the blender. Sorry.. this was done at night so lighting is pretty bad. In a blender or chopper, add onion and 1/2 cup water. Blend until smooth. Add remaining 1/2 c red wine, 1 c sugar, garlic cloves, 4 T sesame oil, 1 T sesame seeds, 1 tsp pepper and optionally 2 T green plum syrup (if you want to). Kalbi Marinade ingredients in blender – sugar, garlic, green onions, sesame seeds are added. Blend until smooth and that’s IT!!! In a container, add Kalbi pieces and the marinade. Mix everything so each piece is evenly coated. Let ribs marinate in the fridge for at least 1 hr to overnight. If you are in a hurry, even 30 minutes will work. Take ribs out of the fridge and heat your oven broiler for 5 minutes. 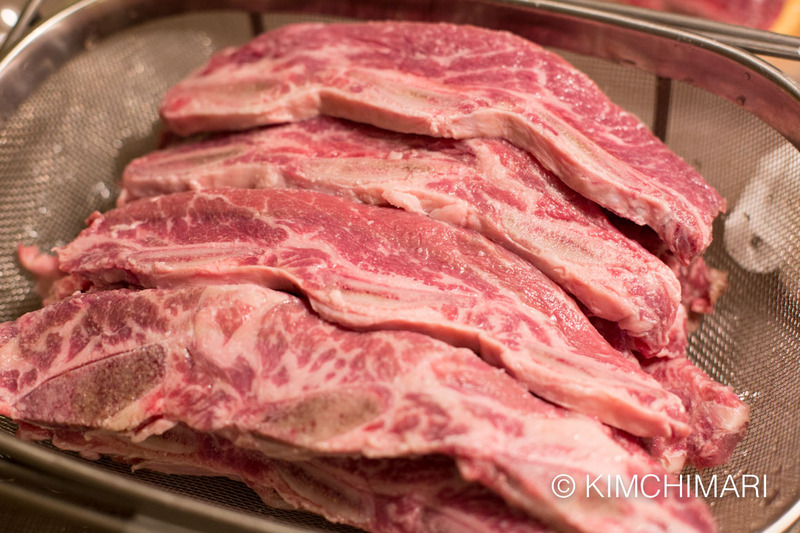 Lay out your Kalbi on a metal grill pan and broil it on the top rack for 4 minutes for the first side. Then turn it over and grill another 3 minutes on the other side until they look marvelous like you see in my pictures. *** IMPORTANT ** The grilling time is for short ribs when they are cold, straight out of the fridge. If ribs were left at room temperature, it will need less time. 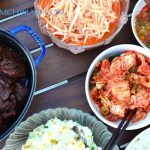 Serve with rice, ssam, ssamjang, kimchi and radish salad. 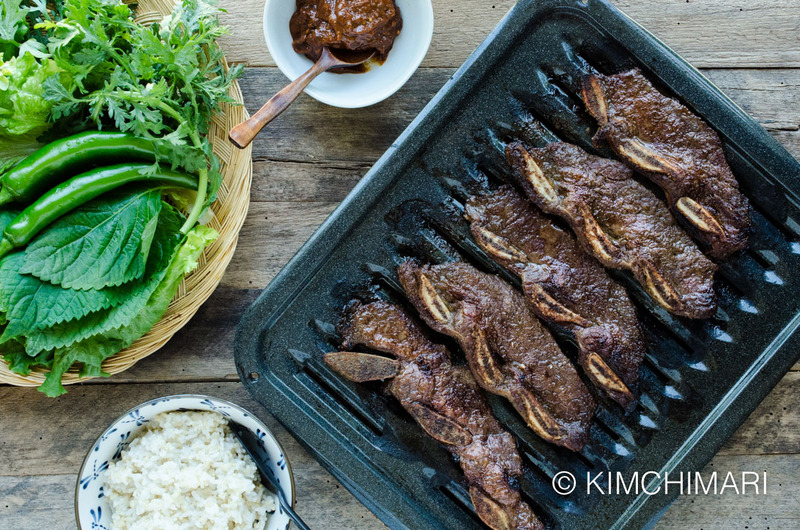 Grilling Korean Kalbi on a charcoal BBQ is the most authentic way but broiling them in the oven also works great – especially when you just want to cook a few pieces. By TOP RACK in the oven, I mean about 4 inches away from the heat source. When cooking Kalbi in your broiler for the first time, you should check your meat OFTEN as every broiler is different and things burn pretty quickly. Here’s a great NYT article on how to use the broiler! KALBI OR GALBI (KOREAN SHORT RIBS), HOWEVER YOU WANT TO SPELL IT, IS SIMPLY THE BEST WAY TO EAT SHORT RIBS ON THE BBQ. Rinse ribs under water to remove any bits of bone. Drain. Trim any chunks of fat but most of the fat will melt away during grilling time. These ribs were good quality ones with minimal fat. Drain washed ribs. While ribs are draining, cut onion into chunks or just half, if onion is small. 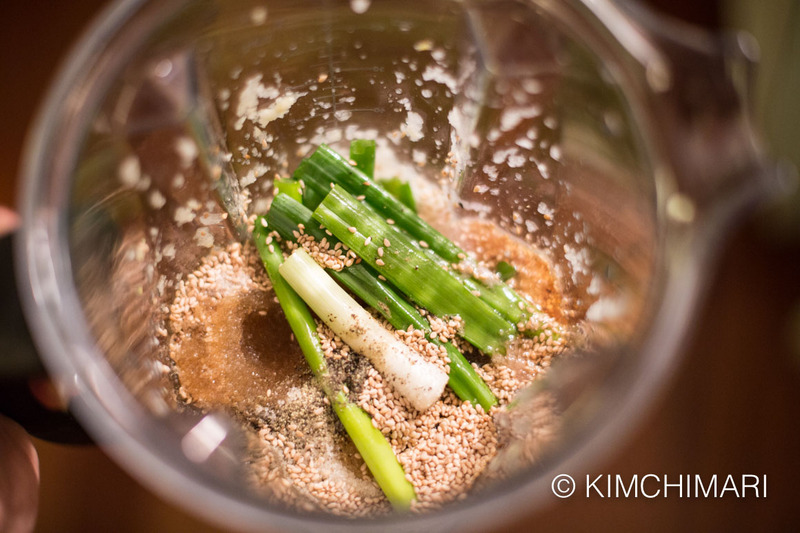 Cut green onions into shorter lengths to fit into the blender. Here’s all the ingredients for the marinade to go into the blender. Take ribs out of the fridge and heat your oven broiler for 5 minutes. 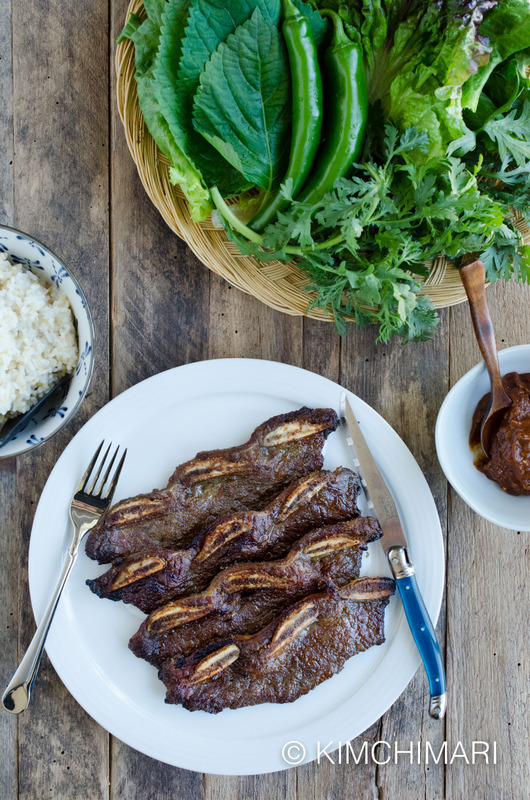 Lay out your Kalbi on a metal grill pan and broil it on the top rack for 4 minutes for the first side. Then turn it over and grill another 3 minutes on the other side. 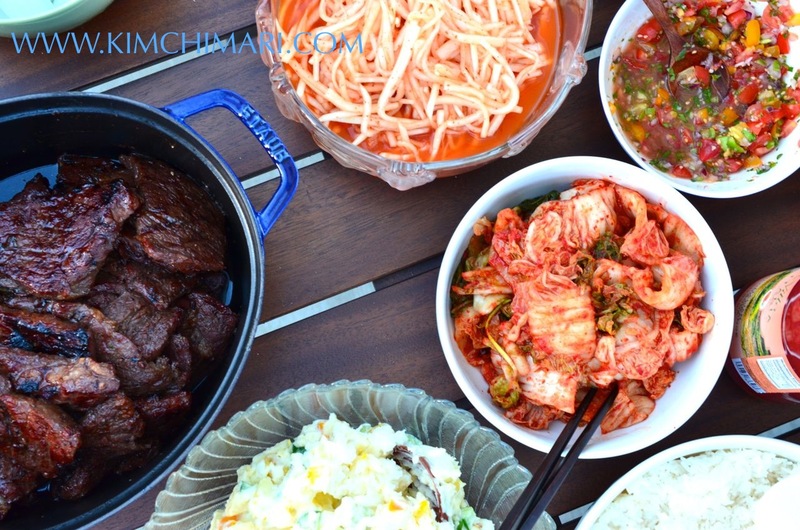 Serve immediately with rice and other Korean side dishes. Cooking time in the broiler is for when short ribs are pretty cold, straight out of the fridge. If ribs were left at room temperature, it will need less time. How long will this last in the fridge? Can I freeze it? Do you want to freeze the marinade itself? or The marinated Kalbi? Marinated Kalbi (uncooked) will last for weeks in the fridge. Cooked will last long too. I have not tried freezing the marinade separately myself but I don’t see why it wouldn’t last for some time but I wonder if the marinade may not be as effective (especially the enzymes that make Kalbi tender) once they are frozen. Hope it helps. Thank you for asking! What kind of red wine do you use? Cooking wine? Any red wine? Oh any red wine. I use Trader Joe’s Shaw wine or any leftover red. Good luck!